Divine punishment Lv 1 is enough as pre-req for Circle of Punishment. We focus more on healing than offensive build. Revitalization Max it, lower cooldown, higher HoT (Heal over Time). Heal Leave this at 3. You just need 5 target to heal (Max party size). Salvage Your instant Emergency heal. You can only get level 1 for now. You will max this later. Look at lv 40 build. Blessing Swiftness Level 2, You can't max it yet, however the 15% attack and movement speed effect helps a lot. Look at lv 40 build. 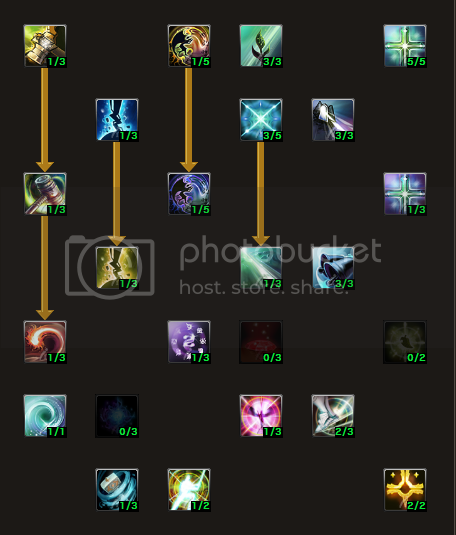 Storm of JudgementLeave this skill at Lv 1 for it's supportive DoT. Nimble healer Max it for it's usefulness during multiple heals. It increases your casting speed when Revitalize or Heal has been casted and can stack up to 3 times. What gears should we get? Cloth or Chain? Staff or Mace/Shield? Cloth would be a wiser choice for more INT. Staff is your primary weapon while Mace/Shield can be your sub weapon if you need to block and heal. im planning to go full support so what weopons/armour should i wear? will getting more int increase my healing? im really new to this game sorry for stupid questions.